This description of Shailabh Kumar's work was prepared when Shailabh Kumar was elected to the Ashoka Fellowship in 2018. Shailabh recognized the need for communities to have the power and autonomy to manage their own health. With this understanding he has designed a community led and managed mutual health insurance model that is changing the behaviors of communities in accessing preventive health care services to remain healthy. In this model, Shailabh on one hand, is ensuring that the communities have greater access to preventive health care services by organizing value-added services like outpatient network, health check-up camps, a 24x7 helpline that provides members with options to manage their health under medical guidance. On the other hand, enabling communities to govern and take key decisions with regards to the services such as insurance premium rates, payout percentage, claim approvals, etc. based on their spending capacities. The design of the model ensures that communities remain healthy by seeking promotive and preventive health services. This in turn, contains the risk of having higher claim rates to sustain the small ticket size (USD 10 per month) of the insurance premium. He is collaborating with existing federations and civil society organization like Goat Trust, Samagra, SEWA etc to scale his work. Additionally he is building sector knowledge by doing extensive research on mutuals and health insurance products in the country and disseminating information on various platforms leading to creation of support groups to impact health insurance space in a big way. Shailabh is building a consortium of leaders in the space of microinsurance to get the Insurance Regulatory and Development Authority of India (IRDAI) to get mutuals and cooperatives under regulatory purview. Uplift Mutual is now spreading their model to 1 million people through their technology-enabled platform Uttam which has allowed effective governance at lower costs. 90% (a total of around 46 crores) of the total workforce in the country is part of the unorganized sector. Families in the unorganized sector of India, who are daily wage earners, have little access to social protection schemes. With a daily income of $2-6 for an average family of four, insurance is not a priority expense, until a destabilizing event happens. While on one hand, this leads the family further into poverty (as they borrow or mortgage or sell to cover costs), on the other hand, timely access to quality care with reasonable prices remains a dream. Uptake of microinsurance in India is still less than 10% of the population, and only 14.7% of the microinsurance market is being covered. The gaps in microinsurance uptake are because the insured population generally suffers from poor services, and lack of transparency and credibility. Most insurance companies take 45 days on an average to reimburse the claimants which is a long duration for informal daily wage earners. The existing insurance models in India are operated based on the concept that insurance is only useful when one becomes ill; if the insured stays healthy, the insurance money is essentially wasted. Since this model provides no incentive for one to stay healthy, marginalized families see no reason to invest in their health. There are huge barriers for the marginalized communities to accessing effective medical care due to misleading information about healthcare from doctors, hence there lack of trust in the system. They have little to no consumer education and are thus susceptible to huge losses. The health protection in India is supply led, where the insurance is not designed based on the needs of the people. The existing schemes provide insufficient information on usability of the insurance and hence there is very little uptake. Government programmes are designed and delivered in a top down manner and hence utilization is poor and private parties make most of the profit from the public money. In India till 1999, all insurance companies were controlled by the government and private players came into play only in early 2000. Mutuals in India are currently unregulated by the Insurance Regulatory and Development Authority of India (IRDAI) and do not come under the purview of the law, hence there is very little scope for insurance companies to follow a mutual model. Shailabh co-founded Uplift Mutuals in 2004, the first mutual insurance organization in India with the main aim of bringing in inclusive risk sharing for low economic segments of the society. The Uplift model is considered the ‘flagship’ mutual health insurance program in India by the MicroInsurance Centre, where it combines active member involvement in insurance product and process decisions with benefits that range from in-patient care to health education. The inclusive risk sharing includes policies that are one price range for all ages. Certain ailment exclusion are validated by the community members based on their context, for example, normal maternity and cesarean delivery is covered in some communities because the women in this community decided they did not voluntarily want to be cut open during childbirth and it was important that the cost be covered under the health insurance program. Hence the community is informed about the risk they are taking so that they can rationalize the insurance premium amount and utilize the money they are pooling together effectively. There is a huge focus on family enrollment to prevent girls from being excluded. Mutual Uplift Schemes function as a pure mutual where the members/clients are also the owners, they take part in designing the product, the processes and are also the key decision makers when it comes to claims. The community members elect a representative for every 2,000 policyholders for a period of one year. A claims committee consists of all elected representatives which also acts as the governance body for the mutual units. Product rules, claim categories, coverage, sub-limits and exclusions are all designed by Uplift and validated by the community representatives. These mutuals are organized by each community, who elect their representatives which are responsible for running the scheme. These community members are trained by Uplift and are ‘hand held’ till they learn the processes themselves and can then become capable of make their own decisions. Shailabh has build an elaborate education and communication process in the entire model which is bringing in transparency and accountability. Through Mutual Uplifts the community representatives get training over a period of time which enables them to take the claims decision and run the scheme according to the set guidelines and rules. If there are any grievances they are referred to the same committee for consideration. Of the total premium paid by a member, around 60% goes into the collective risk pool, 30% goes into organizing value added services such as OPDs, medicines, health camps, 24*7 helpline etc., and 10% goes into the admin cost of Mutual Uplifts that includes salary and running costs of online platform. The model uses ‘value added preventive healthcare services’ as a mechanism to contain the rate of claims. Shailabh has successfully created access to the healthcare ecosystem for the policy holders and hence Mutual Uplifts is not just restricted to making financial compensations to policyholders but is enabling them to take charge of their health. Through claim benefits, discounts on hospitals, out patient care, drugs, diagnostic services, health camps, regular free check ups, Shailabh is improving their access to care by offering timely information. As a result they are incentivized to visit hospitals early when they fall ill and thus reduces their medical expenses. Private hospital care and services which seem like a dream are now made easily available to them through these discounts. To keep the cost of healthcare within manageable limits for members, Uplift provides a 24x7 helpline, access to qualified doctors and a multi-layered network of healthcare providers for quality care with concessions, along with localized referrals and guidance, and a systematic follow-up. Uplift Mutual is the only insurance organization in India to have a MIS (Management Information Software) from 2004, which has enabled its communities to make responsible and rational decisions. Shailabh with his team has collected detailed and granular levels of data over the last decade, which has helped refine its intervention consonance with feedback received from communities. Mutual Uplift employees regularly present the data from the schemes to the community representatives and explain it to them. This information then helps them decide the premium amounts and decide if certain ailments needs to be covered under the insurance. Mutual Uplifts operational model uptill 2016 was called build-operate-transfer, where they build the mutual with microfinance organizations, SHGs and co-operatives, operated along with these mutuals and then transferred the entire know-how to these organizations. 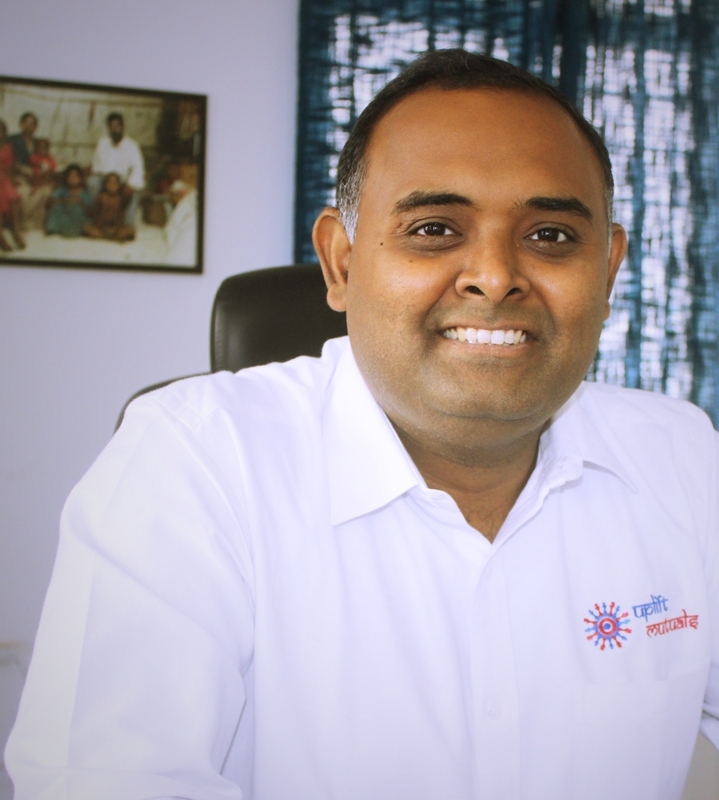 Over the last decade, in its first phase from 2004 to 2016, the proof of concept was established where Shailabh worked with over nine communities to setup 9 different health mutuals that cater today roughly to 300,000 combined lives. It has transferred the management of these mutuals to the respective communities. In 2017 Shailabh decided to change its operational model to directly work with communities, and not just through SHGs, where it could directly pool risks of communities and make it open to work with non microfinance groups and communities. In its second phase from 2017 onwards, Shailabh is setting up a risk pool where different groups/families can pool their risks together. In this risk pool, various groups communities and families can come together to pool their risks together starting from health risks. The design of Uplift Mutual Development and Aid Society (UMDA) is such that it will become the model template for Mutual governance where families from the grassroots will be genuinely represented and become part of critical decision making about risk pooling. With this model, Shailabh is scaling his reach to 1 million people by 2022, and eventually creating mutuals for bettering access to affordable and quality education, and sustainable model of agriculture. Mutual Uplift is the only mutual insurance in India that has designed a MIS (Management Information Software) through strategic data collection since 2004, which has enabled patient reimbursement time to reduce upto 8 hours, compared to the standard market time of 45 days. Shailabh was born and brought up in Nagaland, where both his parents were renowned University Professors. They send him to study outside Nagaland, as they did not want him to be afraid to venture out and build his own life up. From his early student life, he avoided the rat race of education. He was keen on studying the human mind and behaviour and hence decided to take up humanities. He observed across ages that human greed and competition has led to social and political upheavals, while he also learned that these upheavals subsided due to collective action and responses. With the aspirations of becoming a civil servant, he began his studies but quickly realized that he has two options to create impact in the world- either work from within the system or change the system. Looking at the lack of accountability within the government he changed his path and started working towards changing the system. He began his masters from Tata Institute of Social Sciences, where during his internship, he, for the first time brought a small group of women to come together and based on the information provided to them by Shailabh, he enabled them to start their own entreprise. This was when he realised that people can solve their own problems provided they are given the right tools. Shailabh in his early career, worked at some of the most renowned NGOs in India, only to quit within a few months because he recognized that these organizations were designed to create more vulnerability through aid programs that treated marginalized people as receivers of benefits and services as opposed to treating them as collaborators in creating them. These organizations also had rampant corruption and the benefits were never delivered to the people who need them the most. Around the same time he met a French actuary who introduced him to the idea of microinsuare and mutual insurance. They co-founded Mutual Uplift, where the French co-founder brought in global knowledge about setting up mutual insurances and Shailabh played the role of the core entrepreneur who understood the grassroot realities. He realized that most mutuals in the western countries were created by the educated class and Shailabh recognized the need to adapt the model to serve the bottom of the pyramid, which is majority of the Indian population. They set up a model which is now globally recognized for its efficiency in governance processes. Along with other leaders in the space of microinsurance, Shailabh set up the Communities led Association for Social Security, an organization with the vision to bring community-based insurance players on a single platform to build a movement around mutual and community insurance. This setup was facilitated by Shailabh with the help of ILO STEP and GIZ with more than 10 dominant players in the field as founding members. Even though the platform never took off, due extremely diverse interests of the founding members, Shailabh has played a critical role in spreading the concept of mutual across India through his role as the India representative of International Cooperative and Mutual Insurance Federation (ICMIF).